Taylor Fante didn't get a scholarship, she didn't qualify for financial aid, and her parents aren't paying all her tuition. Yet, she's on track to graduate from Ohio State University without any debt. Fante is working her way through college. She's a cocktail waitress and bartender on the weekends, and she makes enough in tips to pay the $10,000 annual tuition. To hear Fante talk about it, you'd think it was easy. She still goes to school full-time, works at an unpaid internship, and although it does put some strain on her free time, she "definitely" still has a social life. But Fante is an outlier. 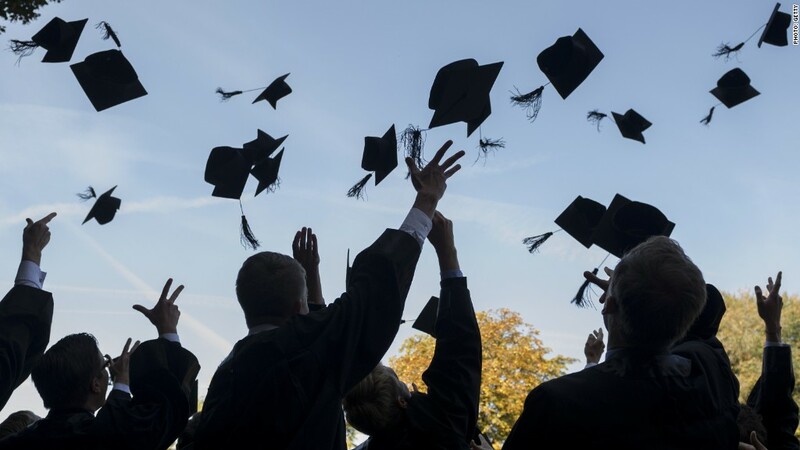 Nearly 70% of college grads will leave school with some student debt, according to The Institute for College Access and Success. The average amount for those who graduated in 2014 was $28,950. The idea that they can pull it off is a "quaint notion from an earlier era," wrote researcher Joni Finney. Fante does get some substantial financial support from her family. Her parents covered all her costs freshman year, and continue to pay for her $650 monthly rent. And her grandparents surprised her with money for one semester of tuition during her junior year. But covering five out of eight semesters herself -- at $5,000 each -- plus her groceries and utility bills is nothing to scoff at. Fante works at a hopping bar on campus where she puts in two nights a week, pulling in about $400 in tips each weekend. The gig is even more lucrative during the Buckeyes' football season when she'll work longer days, making as much as $1,000 between Friday and Saturday. Not every college student can land such a well-paying job that doesn't interfere with their class schedule. And Fante's job in itself doesn't cover everything. She and two other middle-class students told CNNMoney their secrets to pulling off the near impossible feat of graduating without student loans. 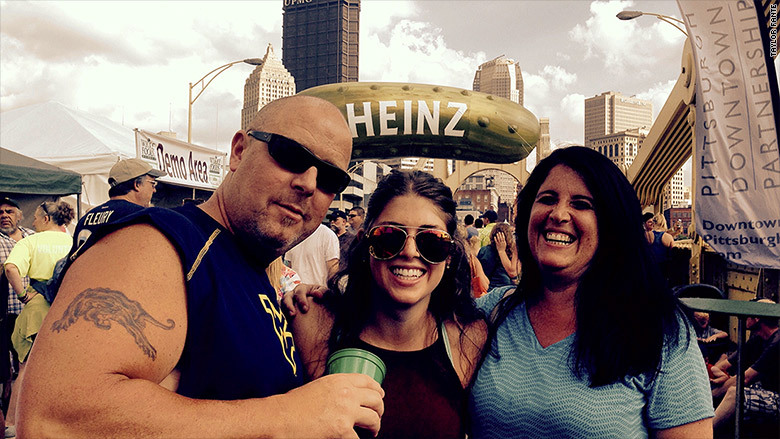 With some help from her parents, Tom and Karen, Taylor (center) is able to work her way through college. On working her way through college: "I usually worked all weekend, every weekend. It definitely was a strain on my social life, but I thought it was worth it so I just figured it out. It was also fun because all my friends were there sometimes anyway," she said. How did her parents save? Fante is one of four kids, but her parents opened up 529 savings accounts for all of them when they were born. Each kid will get about $22,000 from those accounts, and that money covered Taylor's freshman year. Her dad, Tom, started by saving about 5% of his paycheck each month, working his way up about 20% -- and splitting it between the four savings accounts. Every time he got a raise, he would put in more. And he set it up so the contribution would be automatically deducted from his paycheck. She's smart with her money: Fante doesn't make a formal budget, but she does make sure to always deposit all of her tips in a savings account and use her hourly wage -- which as a waitress amounts to about $4 an hour in Ohio -- for daily expenses. "I've always been smart with my money. It's not that hard for me," Fante said. Harry White graduated debt free in 2012. Since then he's built his own house. How he paid for college: An academic scholarship from Arkansas State covered his tuition all four years. But, tuition isn't everything. The average cost of room and board at U.S. colleges is about $10,000 a year. White's dorm cost was covered for the three years he worked as an RA. Six smaller scholarships, two paid summer internships, and help from his dad (for freshman year only) covered the rest of his costs. "My parents are middle class. We didn't make enough money to pay out-of-pocket, but we didn't qualify for financial aid either. I made an agreement with my Dad. If he helped cover the difference my first year, I'd find a way to pay for the rest," he said. How he found extra scholarships: "Throughout the years I saw others getting this money and I'd think, damn, they're lucky. But I would find out when the deadlines were coming the next year and figured out that not too many people were applying for these scholarships," he said. Another money saver: "I went to every freakin' event with free food on campus. I got to know different people, that's the fun of it." 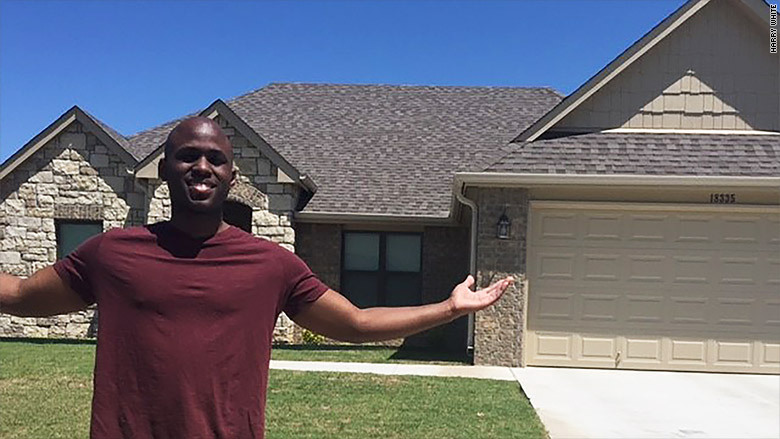 What debt-free means after graduation: White landed a full-time job even before he finished school. He's since built his own house, paid cash for a brand new car, and he and his wife travel often. Last year they went to Africa and Spain. 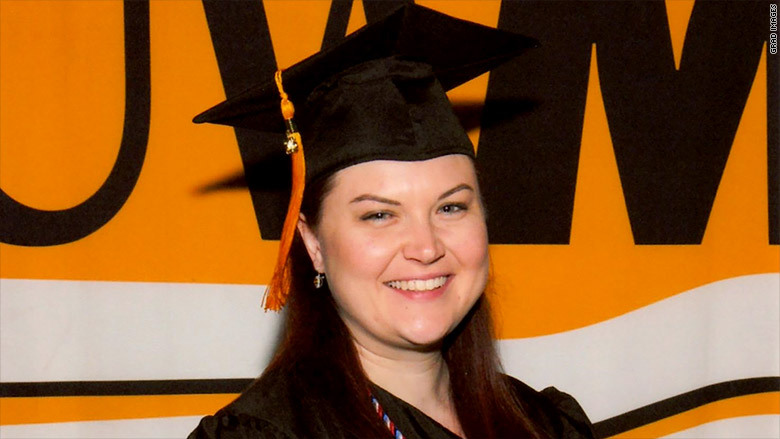 Becky Patterson graduated debt-free from the University of Wisconsin last year. GI Bill benefits: Patterson tried a semester of college immediately after high school, but it wasn't for her. The Navy, she found out, was a better fit. She was trained as a Persian Farsi linguist, and served six years. That made her eligible for Post 9/11 GI Bill benefits, which covers the entire in-state tuition cost at public schools for 36 months, offers a monthly housing allowance, and up to $1,000 a year for books. She also qualified for a federal Pell Grant for low-income students, which she doesn't have to pay back. Finish faster: Patterson loaded her schedule with as many credits as possible and enrolled during extra summer and winter terms. She was also able to transfer some credits from her linguistics training in the Navy. Now, she has an extra semester's worth of GI Bill benefits that she can use to get her master's degree. She starts at the University of Maryland in the fall. "I'm very, very lucky to be able to do it this way. It's pretty much unheard of to have a semester left after getting a STEM (science, technology, engineering or math) degree," she said. Rewards for giving back: Upon finisher her bachelor's degree, Patterson joined Americorps Vista. It's a national program that supports volunteers who commit to a year-long, full-time service project at a nonprofit group or public agency. After their year of service, volunteers are eligible for a grant. Patterson will receive nearly $6,000, which will help her pay for grad school after she finishes her year working with Student Veterans of America as a liaison to college chapters.